After testing a persistent header, Google continues to experiment with infinite scrolling for Google search results. A Webmaster World user spotted a new box that replaces the standard pagination links: "show more results". When you click the message, Google loads the second page of results below the top results. There are many extensions that add infinite scrolling to Google search results pages. One of the best is AutoPager, which is available for Firefox and Chrome. Yes, we all would miss lovable multicolored Gooooooooooooogle. Moreover, sometimes my browser freezes due to infinite scrolling in twitter. I hope it doesnt happen with Google. Infinite scrolling would be good, and a fixed header would make me happier about there not being a search box at the bottom or each page, but what about the classic "Goooooooooogle"? I feel sorry for the tester who has to find out if it continue forever. I'm guessing that infinite is actually subject to the existing limit of 1000 results shown. If not, that would be something big. "Infinite scrolling" is just a name. 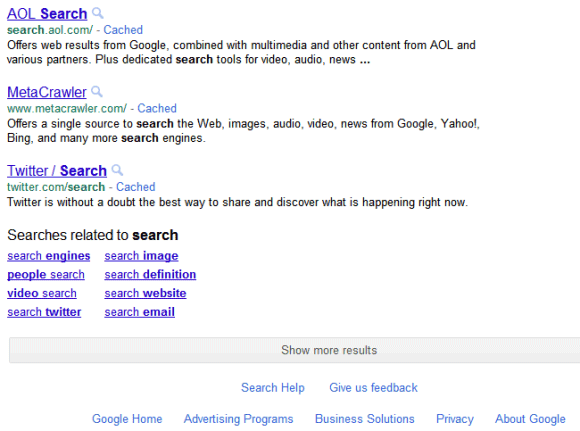 Obviously, the number of results is limited and Google will never show more than 1000 results for performance reasons. I am happy to see googlers are experimenting new concepts on a rapid move. How many results are going to get displayed in 1st page then? 3 as in image shown above? then that would be s***! For God's sake, how to DISABLE this "feature"? I look like an idiot trying to click the links on the bottom of Google's search page, and they always elude me as I get thirty more results I didn't ask for instead. - infinite scroll. I discovered this existed when I types a phrase and tried to go directly to the 5th page of results. Why? Because I was translating, and I wished to get an idea of how often an english expression is used. So I take a peek at the 5th page and see if it still shows coherently there. Not anymore. I see a trend here: Google is fine, Google thinks it needs to invent something, Google invents something useless, Google shoves it in our faces, in some cases without easy ways to disable it. Google, please STOP helping us with our searches. Please STOP helping us save keypresses and clicks, only to make us click more and more. this is a bad idea. everyone is familiar with the ten result pages, and often use it as a gauge of how relevant results are. it will certainly not go down well in SEO circles.